After my work on the Syma 107G was featured on Hackaday, [Maksim] emailed me to talk about writing up a programming library for the Syma 107 control protocol that would allow someone to control an RC boat, car, etc… with the S107T2 controller. I thought this was a cool idea, so I gave it a shot – here’s the lowdown on SymaLib. Get the SymaLib library (v0.1) here. The library was written for the Arduino IDE v1.1 and is designed for use with a sketch similar to Adafruit’s IR Commander sketch (reference, github). I started with the excellent Adafruit Industries IR Commander sketch as it is easy to understand and takes care of populating an array with the on/off pulse lengths for me. With this raw material, all the SymaLib library has to take care of is parse the received pulse lengths into their respective bit-wise values and provide a series of methods to get the parsed values of the handset’s controls. Version 0.1 currently allows you to parse the 32-bit control packets from the S107T2 controller (described in my protocol spec: here) and return each control value as an integer. to decode control signals from a S107T2 RC helicopter controller. // control packet, SymaLib returns boolean True. // Read the controller values and do whatever you need to with them. Constructor. No arguments – initializes control byte array. 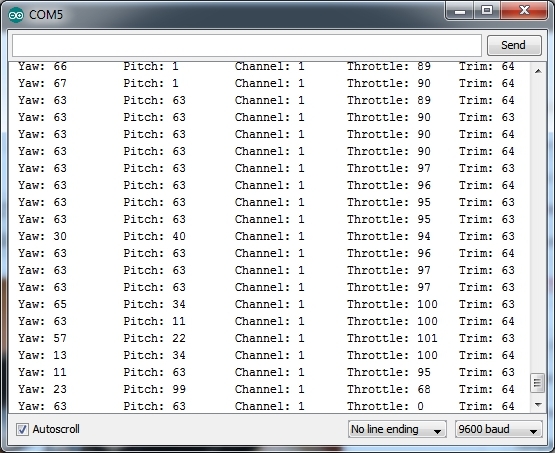 uint16_t pulses – The pulse array populated by the ‘listenForIR’-like method. int& numpulses – The number of pulses heard by the ‘listenForIR’-like method. int resolution – The RESOLUTION constant used to calibrate the IR listener. int fuzziness – The FUZZINESS constant used to calibrate the IR listener. This method parses the pulse-array and stores it as an array of integers, either 1 or 0. This array is the basis of the object’s Get methods. Returns an integer of the decimal value of the Yaw control. Returns an integer of the decimal value of the Pitch control. Returns an integer of the decimal value of the channel switch. Returns an integer of the decimal value of the Throttle control. Returns an integer of the decimal value of the Trim control. Returns a String of ‘1’ and ‘0’s representing the 32-bit control packet. Useful for debugging. This is the first Arduino library I’ve ever written (hopefully not the last!) and I hope it is useful for other hackers. [Maksim]’s idea was cool and I’d love to see any projects that end up using it. Let me know in the comments! It is possible to see your arduino code with smooth equelizer – this from YT ? I like what youve done 1000 thnx Amigo.How about Microcontroller C code ??? I wonder if the serout serin MBASIC commands used in programming Microcontrollers efficiently implement the Syma 107 control protocol .I work with Microchip uCs because of lack of other family types on the local market. Hey Roberto – I’m certain you could implement the protocol with a PIC/Microchip uC, all you need to do is have a control loop to sample (if you’re using analog electronic control inputs) or convert (if you’re using a computer/keyboard) your control values, then construct a 32-bit serial data packet. Then all you have to do is flash an IR LED according to the 0 or 1 symbols, and you’re in business. I’m about to post the code I use on an Arduino Uno which should make it pretty easy to see how I went about it. Best of luck! Thank you for the reply.I wonder if you already cooked the code for Microchip uCs.I have a problem of synchro and gliches. I am working on a project for students for autonomous hovering Quadrotor maintaining the altitude fixed for let say 10m while making use of an ultrasonic transducer for height measure. Hey Roberto – that project sounds great! What Quadrotor are you using? I’m just finishing up a series of in-depth posts on hacking and re-implementing the 2.4Ghz protocol for the Hubsan X4 micro-quadcopter – maybe that’ll be of interest to you.